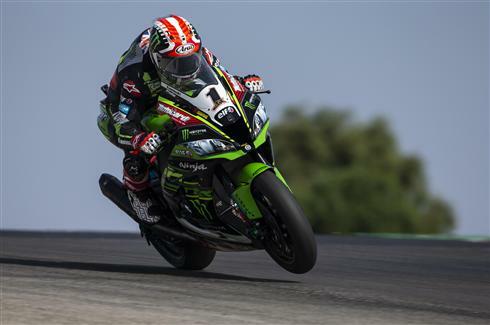 Jonathan Rea (KRT) finished fastest rider of all on the first day of competitive WorldSBK action after the long summer break, with his team-mate Tom Sykes coming back from recent injury at high pace, to go seventh fastest overall. Setting a 1.41.817 lap time that was well under the lap record pace on race tyres, championship leader Rea made the most of improved track conditions compared to an official Portimao test session held only last month. He set his fastest Friday time on the Ninja ZX-10RR in the very first session, using settings he and the technical staff had evaluated at the tests. After suffering ligament damage to his ankle in a recent sports training accident Sykes made his return to competitive action at Portimao having missed the August test session through injury. He felt immediately at home on the Ninja ZX-10RR, and was third fastest after FP1. He only dropped down the final Friday ranking as he did not resort to using fresh tyres near the end of FP3. It was a productive and positive first day in Portugal for both KRT riders, even though they had to deal with a red flag stoppage shortly after the start of FP3. Rea also had a slow speed fall in FP2, but thanks to quick work from his team he was able to get back into action at high pace after his machine was repaired. Both KRT riders have qualified directly for Superpole 2 on Saturday which will determine their final starting positions for race one, scheduled to start at 13.00 Portuguese time. Race two will take place on Sunday the 16th of September, in an unusual 15.15 time slot. Toprak Razgatlioglu (Kawasaki Puccetti Racing) put on an excellent display of improvement today as he finished up fourth fastest, having started his day 11th. Leandro Mercado (Orelac Racing VerdNatura Kawasaki) was 16th fastest today, Yonny Hernandez (Team Pedercini Racing Kawasaki) 18th and Roman Ramos (Team GoEleven Kawasaki) 19th. This entry was posted in Global News, Moto, Motorsports, Road Racing by admin. Bookmark the permalink.